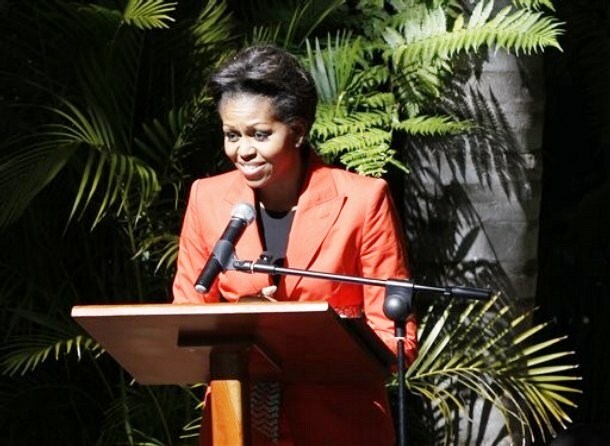 U.S. first lady Michelle Obama speaks at at multi-generational women leaders luncheon at the Sanitas Tea Garden in Gaborone, Botswana, Friday, June 24, 2011. *Pals Oprah Winfrey and Michelle Obama, who both happen to be in South Africa at the same time, got together to hang out Tuesday evening, a White House official said. The first lady is in the middle of a week-long tour of South Africa and Botswana, her second official solo visit abroad as first lady; while Winfrey is in the country for an event related to her school, the Oprah Winfrey Leadership Academy for Girls, and as previously reported, to receive an honorary degree from the University of the Free State. Kristina Schake, Obama’s communications director, said the two women met at the first lady’s hotel in Johannesburg and ate together. Tuesday was Obama’s first full day in South Africa. She arrived on Monday night with her daughters and her mother. Winfrey campaigned for President Barack Obama when he was a senator from Illinois running for the White House. She and the Obamas consider each other friends. Mrs. Obama left Johannesburg on Wednesday for Cape Town. On Thursday she was supposed to visit Robben Island, where former South African President Nelson Mandela was imprisoned for decades, but the trip was canceled because of choppy seas. See pics from today’s visit to Botswana below.